Charlie had a big week. 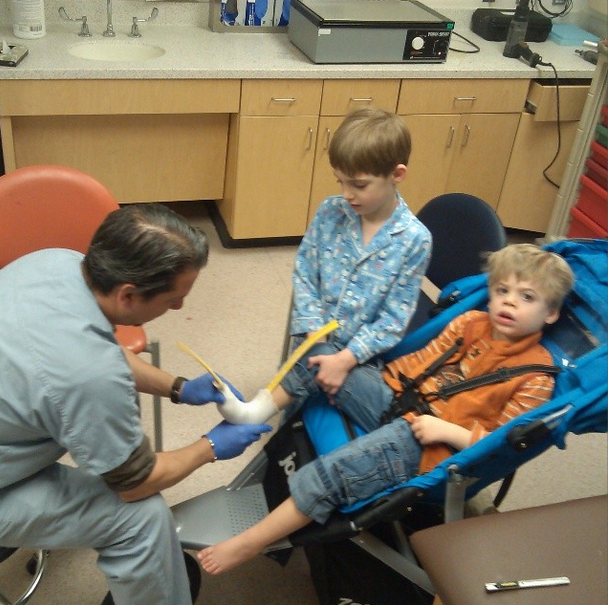 He started off at the orthotic clinic for a physical assessment and brace measurements. He's being outfitted with an entirely new set of gear. By March, he'll have two new leg braces, an elbow brace and a wrist brace! He'll look like the bionic boy. All of this bracing is to assist in alignment and limb articulation. It will be especially helpful for him while using the gait trainer. Then Charlie had a visit from United Seating & Mobility because his wheelchair needed re-tooling to compensate for his rapid growth. Charlie is really off the charts for length and at 43 pounds, he needs more room to roll. 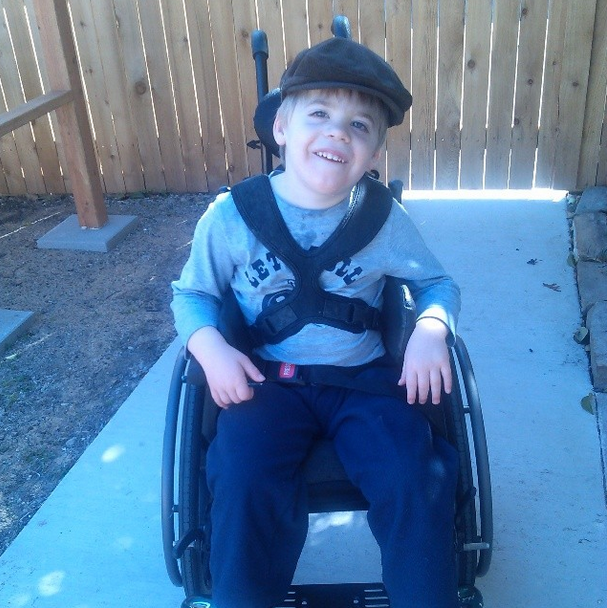 Charlie responded to his wheelchair adjustment with a big smile and a loud, "Yeah yeah yeah!" And finally, Charlie paid a visit to Children's Hospital this week to receive a round of Botox injections to combat his over-toned muscles due to Cerebral Palsy. The doctor injected Botox directly into his affected muscles to artificially relax them. The idea is this will aid in Charlie's limb extension and control of his body. The Botox lasts for about 3-6 months, so he'll likely repeat this process again. While the injections were painful and somewhat frightening for Charlie, his family hopes that the benefits will outstrip the initial discomfort. The Greenman Family insurance is covering 80 percent of the cost of the Botox treatments and 60 percent of the cost of Charlie braces. If you're interested in helping the Greenman Family pay for their portion of Charlie's medical bills, feel free to contribute to Charlie's fund by clicking the button below. Thank you for your good thoughts and support! P.S. This winter, the Greenman family built a wheelchair path and gate through their back yard so that they can more easily get Charlie in and out of the car. Creating wheel chair accessible details for their home will be a long process, but this is a great start. Charlie is pictured above in front of the new gate. Yay for mobility! Big brother Walker, helps the clinician measure Charlie's legs for the new braces. 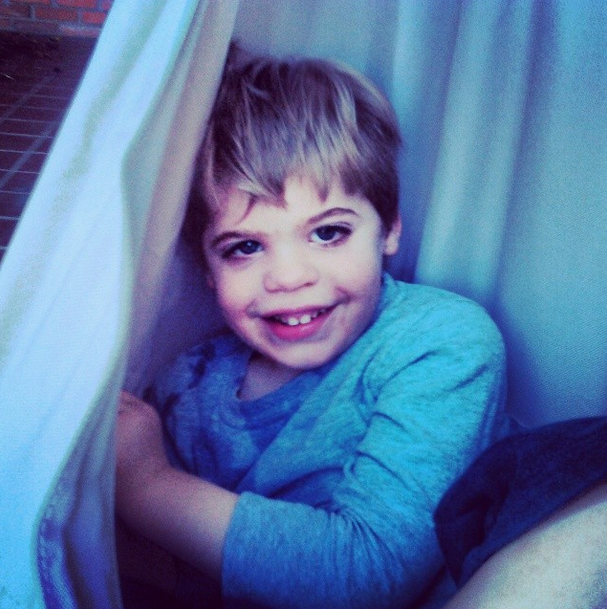 Charlie in his therapy swing.